A good friend can always be relied on to remind you not to take yourself too seriously, not to get too pompous and above yourself. So while, I’m sitting here getting all airy fairy and poetic about finding the true meaning of peace and spiritual health in the wild, lonely places of this land, one of my friends pops up and hauls me out of my Wordsworthian daydream, to remind me of the dangerous situations to which such over romanticising can lead. It is, as he correctly pointed out, methylated spirit. He casually pointed out that it was possibly not positioned in the best place, for a thirsty rider could easily grab it by mistake and down it in one. With unpleasant consequences. 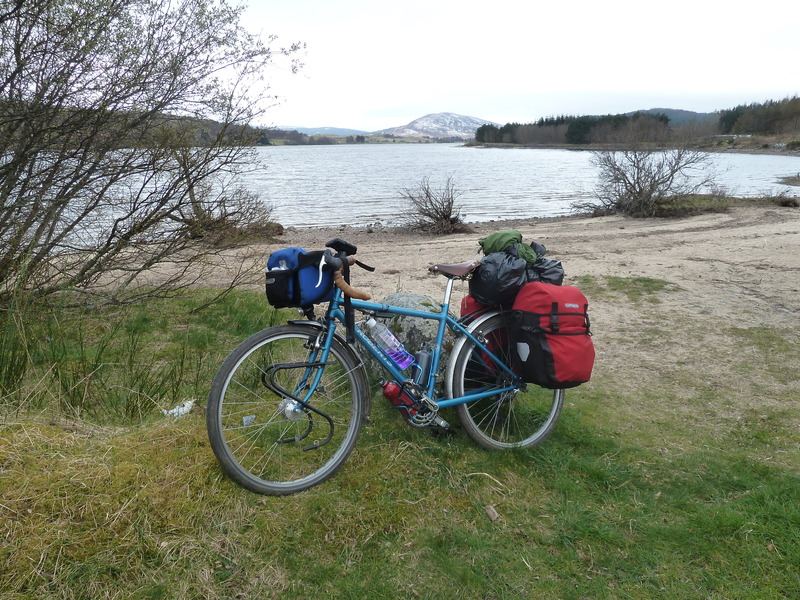 Well, obviously, I had planned for this eventuality, for as you can see the lovely Roberts Roughstuff pictured has three bottle cages, and the red bottle in the one tucked way out of reach under the down tube is the true resting place of this toxic fuel when I am travelling. The tiny bit in the bottle above was just a temporary resting place for a wee bit of excess fuel at the time. Phew! However, my foolproof location only works when the bike is upright. 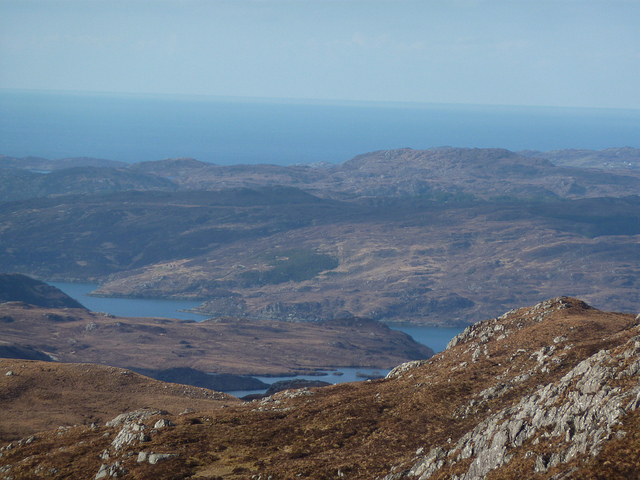 One hot, summer day in the north west of Scotland, (they occur more frequently than you may suspect) I was riding up the road from Ullapool on my way to Scourie. This shows the road in April on a different trip. Imagine the top of this climb on a very, very hot day. 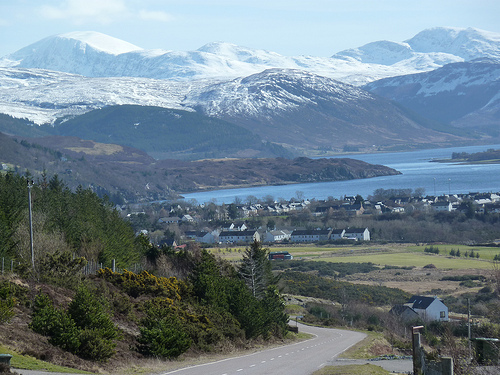 So blank out that snow, for a start, and the view of Ullapool, because you couldn’t see it by then, but anyway. which is a bit further up towards Kylesku, and is actually more reminiscent of the terrain upon which I threw down my bike, hot, exhausted and thirsty and reached up and behind my head, unseeing, for a cooling draught of the cold, mountain springwater with which I had not long before filled my water bottles. However, if you throw your bike down, and collapse to the ground below it, the underside of the downtube, safely out of reach of a thirsty rider in the saddle, suddenly renders a bottle cage positioned there the first one a groping hand, thrown up in exhaustion to wrest the refreshing liquid from its resting place, will find. A gulp of meths is a strange thing. For a second it’s not too unpleasant. A slight hint of sweetish menthol, which made me wonder had I actually put some kind of energy drink in it without remembering and was indeed suffering a touch of sunstroke. Then the evil foulness takes hold of your taste buds, and, fortunately, you begin to retch, spit, find real water and drink copiously, washing out your mouth again and again in a vain attempt to rid yourself of the indescribably ugly taste. But it will not go- whatever you eat drink or gargle, that nastiness monopolises your taste buds for the rest of the day. I do not think I will ever make that mistake again. Sent this way by Rebecca Olds! Cheers! Where’s your blog then ianmac? I always like a new bike blog. I try to keep two blogs going and succeed more with http://ctcnorthampton.wordpress.com than with http://ianmac55.wordpress.com. The CTC Northampton blog is starting to write up a visit we just paid to our German twins at ADFC Aachen. I loved cycling there! I found you…nothing can ever really hide on the internet. Also, nice blog, very nice pics.